Black or longhorn crazy ant Paratrechina longicornis, copyright Efram Goldberg. I have to admit that my ant-identifying skills are fairly rudimentary. I can recognise some of the more distinctive and/or common varieties—meat ants, bull ants, strobe ants, maybe even green-headed ants—but that's about as far as it goes. One ant species that I would have a decent chance of recognising right off the bat, however, is the black crazy ant Paratrechina longicornis. Black crazy ants are an excellent example of what ant experts refer to as 'tramp species'—generalist species that have spread over a wide range in association with humans. Indeed, the black crazy ant is believed to be the most widespread of all ant species (Wetterer 2008): in tropical regions, it is nigh-on ubiquitous, and in cooler regions it lives within buildings and other warm structures built by humans. So widespread is it, and so readily does it spread, that we can't say for absolute certain where it originally came from: most likely it originated somewhere in south-east Asia, but other possibilities have been considered over the years. 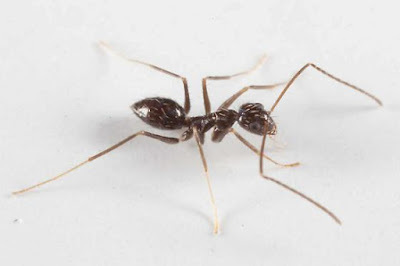 Black crazy ants belong to the ant subfamily Formicinae; as such, they lack the sting carried by ants of other subfamilies and instead have a nozzle-like pore in its place that they use to spray formic acid at perceived threats. They are distinguished from other ants by their slender appearance, with numerous upright bristles on the body, and long legs and antennae. The antennae are most distinctive, with a particularly long scape (the first antennal segment, before the sharp 'elbow'). Paratrechina longicornis are known as 'crazy' ants because of their erratic mode of foraging, wandering about seemingly aimlessly and not following clear trails. Other ants with similar modes of behaviour have also been dubbed crazy ants, such as the yellow crazy ant Anoplolepis gracilipes, but they are not close relatives. Effectiveness in numbers: black crazy ants bring down a Florida carpenter ant Camponotus floridanus, from AntWeb. Black crazy ants may form large or small colonies as circumstances allow; part of the secret of their success is that these colonies can be found in man-made marginal habitats such as on ships at sea. Crazy ant colonies may reach plague proportions; this website relates an account of students at a Florida primary school being so beset by crazy ants that food and other possessions had to be kept in sealed bags on tables at all times with the table legs set in bowls of water to prevent the ants crawling up them. Black crazy ants produced winged reproductives like other ants, but the new queens remove their wings before they expand and emerge from the nest already wingless. While at first glance this seems counter-productive, I can see this behaviour being another factor in their success as a tramp. Colonies living in isolated habitatssuch as the aforementioned ships and buildings in cold climates will tend to persist in that location, rather than losing all their reproductive potential in fruitless exploratory nuptial flights. In recent times, P. longicornis has been recognised as one of a number of species in the genus Paratrechina (of which it is the effective type). However, a phylogenetic study by LaPolla et al. (2010) of the group of genera to which Paratrechina belongs has found that the genus as then recognised was polyphyletic. Rather than being directly related to other 'Paratrechnina', P. longicornis was most closely related to two south-east Asian genera Euprenolepis and Pseudolasius. This lead to the resurrection of two older generic names, Nylanderia and the cringe-inducingly named Paraparatrechina, into which all Paratrechina species other than P. longicornis were transferred. LaPolla, J. S., S. G. Brady & S. O. Shattuck. 2010. Phylogeny and taxonomy of the Prenolepis genus-group of ants (Hymenoptera: Formicidae). Systematic Entomology 35: 118–131. Wetterer, J. K. 2008. Worldwide spread of the longhorn crazy ant, Paratrechina longicornis (Hymenoptera: Formicidae). Myrmecological News 11: 137–149.